I did the photography on the first go-round of making the recipe, and the photos aren’t really a fair justification to the recipe below, which is much more green and smooth than the first. But I was super busy and didn’t have time to snap anything but a quick photo of the “bucket” of the final split pea soup recipe. You get the idea, hopefully enough to trust my recipe! Growing up, I LOVED split pea and ham soup from the moment it was introduced to my little taste buds. Weird kid, I know. It’s a dish that hasn’t been anywhere near my radar until recently, when I picked up some dried split peas on a whim. I’m a frequent bulk bin shopper of all legumes and grains, but I was trying to branch out from my usual brown rice/quinoa/black beans/chickpeas routine. 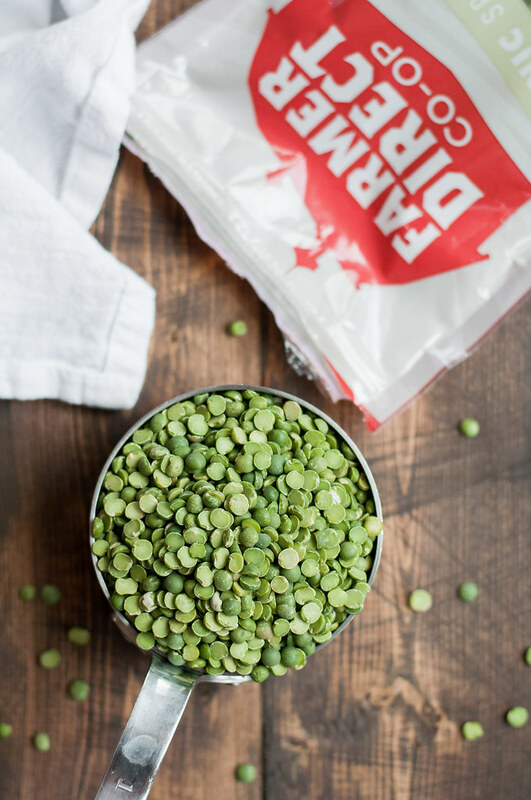 I’ve actually never bought dried split peas before, and the only recipe on the entire interwebs for split peas is your basic hammy soup. I pushed them to the back of the cabinet but was confronted by their presence this past Sunday while planning dinners for the week. I also knew it’s about dang time I get back to blogging everything I cooked in July, and what better place to start than…soup in August? 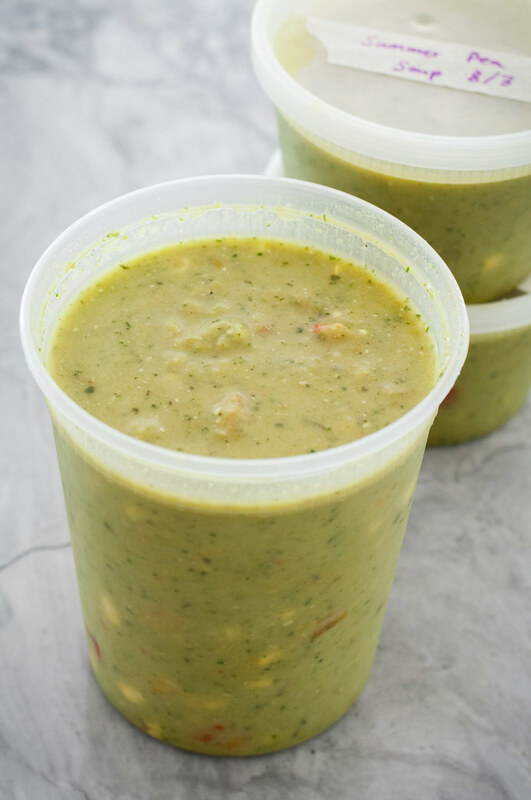 I have Pinterest to thank for remembering a summery split pea soup recipe I came across this time last year, and the ingredients are so bright and fresh that if the heat ebbs even slightly, as it did for us this week, you’ll have all the excuse you need to make this freezer friendly soup. Why am I all of a sudden resorting to freezer recipes? Life has been hectic, as you might have noticed by my total absence from the blog in July. I’m trying to keep up a little on social media, so if you’re still following–thank you! I miss not only posting but the community–nothing beats logging in to find a comment that you’re drooling over a recipe, or, better yet, that you made (and loved) it for dinner! My sister and her husband came up from Oklahoma. We spent July 4th road trippin’ to Boston, and I helped Tor make some headway on the website for her new photography business. I played Food Network Star at a bridal shower for 40. This was WEEKS of prep, including designing and printing recipe card favors which turned out so amazing, and demonstrating and serving avocado feta salsa, summer squash tostadas, and Mexican kale salad…in a barn…with no water supply! It was a blast, the audience was so engaged, and I got a glimpse of the catering life: i.e., I learned that there is no shortcut to plating 40 of anything, even a simple appetizer. My mom came to visit from Minnesota. She got to meet Clarence, then she spent some time in NYC with my other sister. We ate a healthy balance of homemade salads and totally sinful BBQ, after which we somehow thought ordering dessert was a good idea (okay it kind of was). Along with a couple of the best ladies I know, I hosted a baby shower: it’s twins, it was a family shower, and we did food for EIGHTY! Largest baby shower ever, but also the most love-filled. I’m hoping to write a post on the menu and details soon. Steve made sure I had a surprise filled and peaceful 31st birthday after all the hubbub. Our farm-to-table meal was finished off with the best Italian donuts and butterscotch dipping sauce I’ve ever tasted (and I’ve tasted a LOT of donuts). August promises to be much quieter. I’ll be spending my days in the kitchen and at the computer, but we’re also (finally) diving into really getting moved into our house and starting the decorating process (we’ve only been here 9 months :) The countdown is on to hosting Christmas! We’re also in the market for another puggy!!! Clarence may get a fur sibling, and it miggghhhhtttt be a sister. Updates soon. The key to a truly delicious split pea soup? 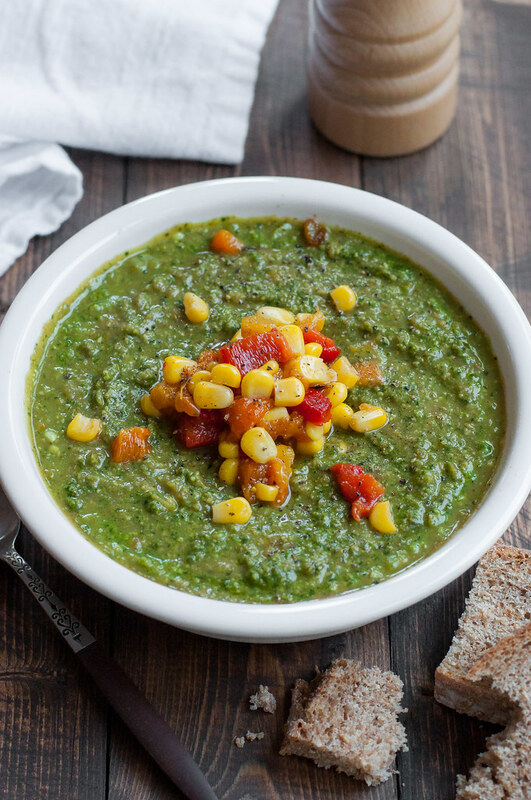 Instead of hiding the pea flavor with tons of pork products, this vegetarian (and vegan, depending on your pesto choice) soup recipe complements their earthy quality with bright, fresh summer ingredients. Heat 2 tablespoons olive oil over medium heat in a 3 to 4 quart pot. Add onion, shallot, and celery and cook until just softened, about 5 minutes. Add garlic and cook for a few minutes, until just beginning to brown. Add bouillon cubes, basil, and ⅓ cup water or white wine. Increase heat to a simmer and cook until bouillon is dissolved and liquid is reduced by half. Add 10 cups water, the split peas, and 1½ teaspoons salt and bring to a boil. Reduce to a simmer and cook, uncovered, for 45 minutes, until peas are soft and breaking down. Meanwhile, coat the peppers lightly with olive oil and broil near heat for 20 to 25 minutes, turning occasionally, until charred all over. Place peppers in a metal or glass bowl and cover with foil or plastic wrap, a dish towel, and a dinner plate to seal in steam. Remove using a tongs after 20 minutes and cool slightly. Peel the peppers but don't run them under water (it removes the smoky char). Remove seeds and stems, then dice and set aside. If desired, cook corn in a dry skillet over medium to medium high until mostly darkened, and set aside with the peppers. Once peas are done simmering, maintain heat and stir in spinach. Cook for a minute or two until just wilted, then cool slightly. Puree with an immersion blender or in batches in a blender, then return soup to pan. Stir in peppers and corn (reserving a few for garnish), lemon juice, pesto, and additional salt and pepper to taste. 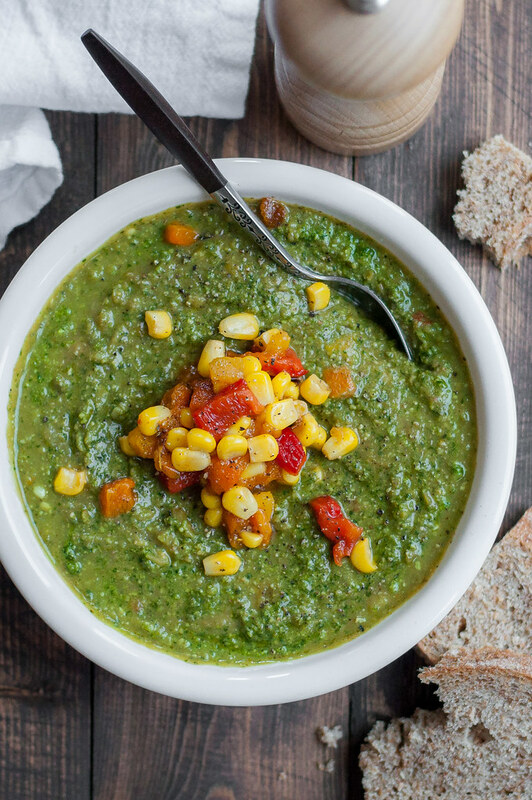 Serve soup with extra pesto, peppers, and corn, or freeze. 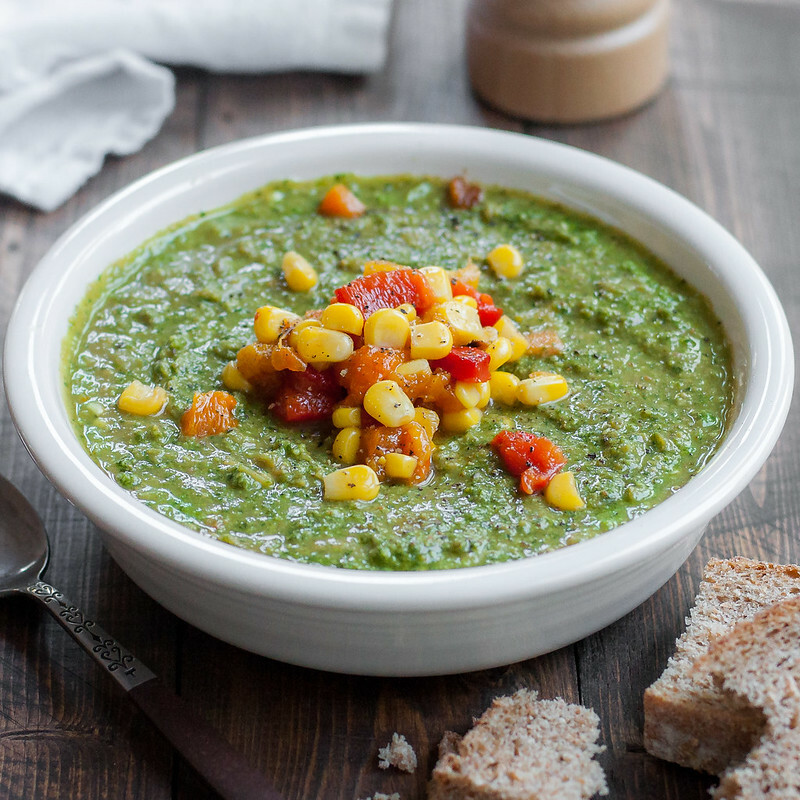 Adapted from Cali-Zona's yellow split pea basil soup.